Dats Print Services opts for Speedmaster. 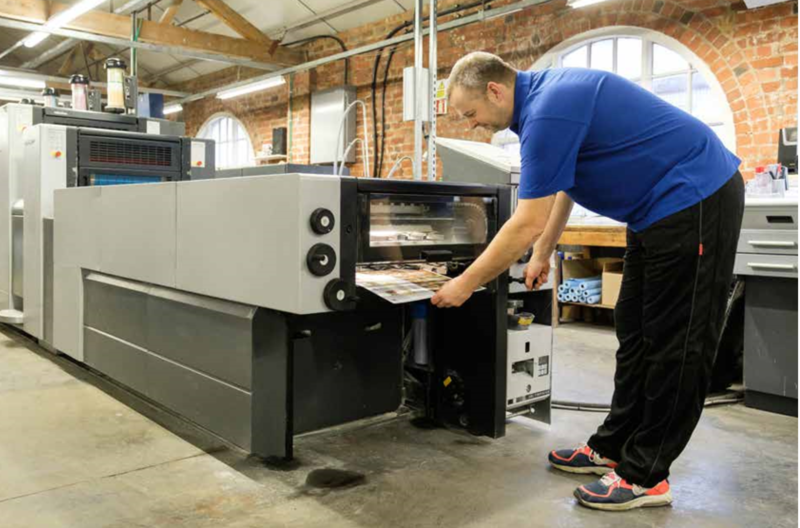 Dats Print Services has invested around £280,000 in a secondhand four-colour-plus-coater Heidelberg SM 52 Anicolor to enable it to take on new work, save time, and be more cost-competitive. The press, which was bought from Heidelberg, was installed at the Irthingborough, Northamptonshire-based firm’s 2,800sqm premises around three months ago. The Anicolor replaced a Speedmaster 52-4, which the company sold on. The machine is being run alongside two Printmaster perfecting presses, a five-colour and a two-colour, and a Xerox 700 digital colour printer. This machine has got a coating unit, which we never had before, so we can now offer high-gloss and satin finishes, which is all done inline in one process through the press. We’ve also got an extended IR drying unit,” said Brown. The press, which runs on a double-day shift, has increased plate demand and an additional person has been allocated to pre-press to ensure plate output is maximised. “Before the press arrived the operators were finding the concept of having no ink zones strange but they have been really impressed by the technology,” said Brown. Dats Print Services has 25 staff and a turnover of around £1.6m, which it is hoping to increase to £2m following the Anicolor buy. The firm predominantly produces general commercial print, business stationery and booklets for print management companies.